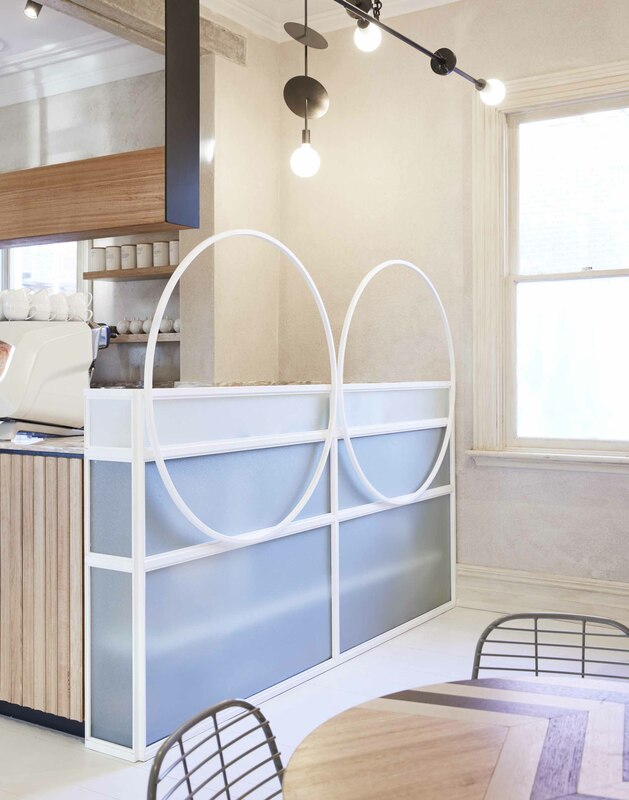 Designed by Killing Matt Woods, the interior of Percy Plunkett café in Penrith, NSW is a unique response to heritage, as inside co-editor Gillian Serisier discovers. Approaching each project as a unique entity, Killing Matt Woods (KMW) produces interiors that are never expected, always interesting and, more importantly, completely relevant to area, client and aspiration. This is a rarity, despite most designers considering this tactic to be their own. For Percy Plunkett, even the delicious name comes from an approach that speaks to the project’s quintessence. Indeed, when researching the history of the house, Killing Matt Woods director, Matt Woods, went through council records and found that Percy Plunkett was actually a previous owner. Really. In fact, after the café was complete, the descendants of Percy Plunkett held their reunion there. Nice. What makes the project unique within the KMW oeuvre is the very, very pretty nature of the tonal shifts, floral motif and attention to Heritage detailing. Conversely, what gives it accord is the exceptional bespoke lighting, locally made custom furniture and a really fine attention to who will be using the spaces. This is relevant to the house itself in particular, in that the design presents as a contemporary open and light-filled set of volumes without making a negative contrast or irony of the house’s history. 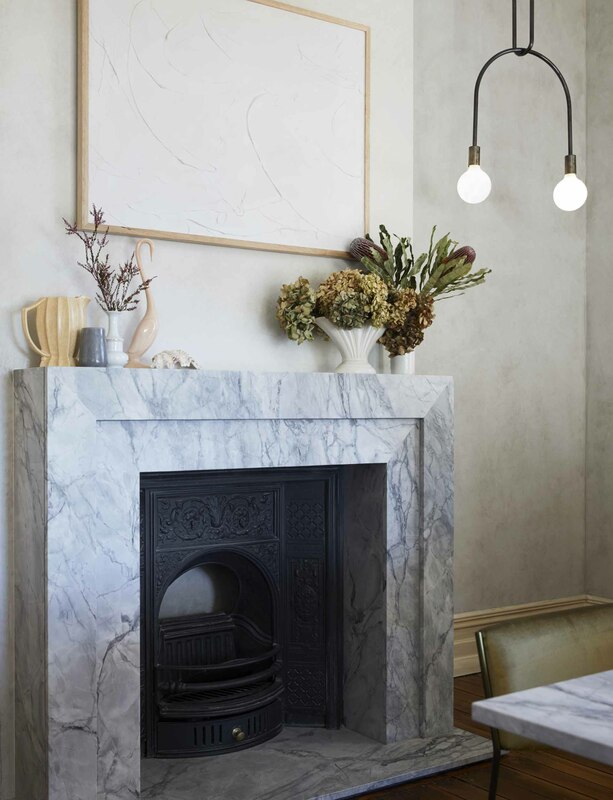 Rather, the details of Heritage have been left intact or refinished, as with the newly clad marble fireplace. The beauty of this lies in the simple fact that someone drawn to a Heritage façade is not looking for a screaming neon interior; nor are they looking for lavender and chintz. Formerly a Thai restaurant, and before that a home, the house’s layout, in keeping with its Victorian era architecture, comprised a central 64 previous—The warmth of Norwegian rose marble (Artedomus) and fluted timber gives a domestic air, while the gantry provides an unobtrusive separation. 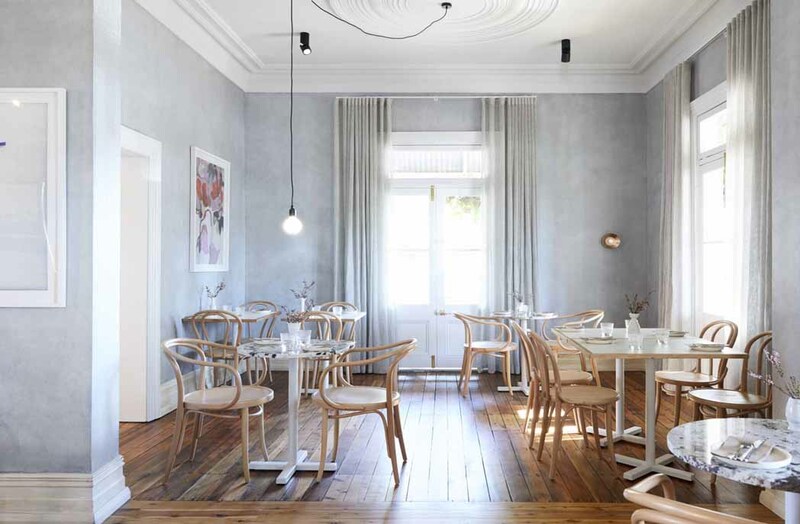 above—Bentwood chairs, timber floors and soft blue washed walls invoke the romance of the era without the clichés. right—Volker Haug’s Oddment feature light lends a formality to the private dining room corridor with a volley of rooms to either side. After the removal of an interior wall (with Heritage permission) to create a larger main volume, the intimacy of the smaller rooms has been largely retained. The charm of this strategy is the creation of separate spaces for a dining café and private dining room. It also allows the maître d’ to open spaces as the rooms become booked, so there is never a sense of sparse patronage, to say nothing of the practicalities of service. Part of the central corridor has been closed off as a conservatory with a partial change from steel to plexiglass to allow the light to spill through the ceiling. 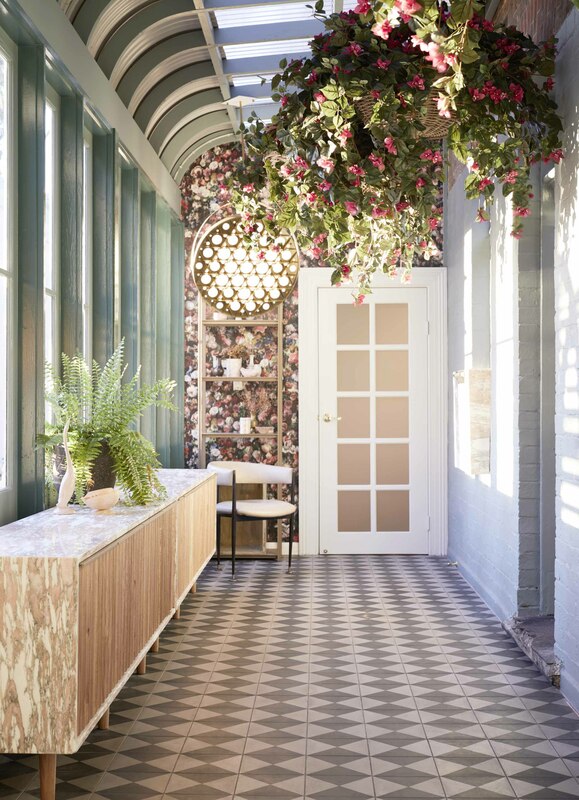 This lovely room has an end wall of cabbage rose wallpaper (Botanica 2, Flower Pool, Kingdom Home), a ceiling of hanging baskets of bougainvillea and a long credenza of timber and Norwegian Rose marble (Artedomus). A single mid-century armchair (Vampt Vintage) provides a moment of pause, while a spectacular circular brass feature light (Surgeon, Lost Profile Studio) reads as an elaborate round window from some angles and a sculpture from others. For Woods, the answer is bentwood chairs, a continuation of his obsession with circles and a palette of natural materials. The café section to the right of entry has walls in warm sand tone (French Wash, Bone, Soapstone, Porter’s Paints). Hand finished and ragged off with muslin for a slightly brushed finish the walls provide a textural continuation, within a tonal shift, with the long velvet curtain covering one wall. Bespoke timber tables are inlaid with geometrics and locally made, to Woods’ specifications, in Penrith. Half Hurdle benches (Dowel Jones) make a neat departure from table and chair configurations. The sculptural lighting continues Woods’ long-term collaboration with Volker Haug, with bespoke pieces in black and white beautifully scaled to the room. Creating the service bar is a combination of moves. 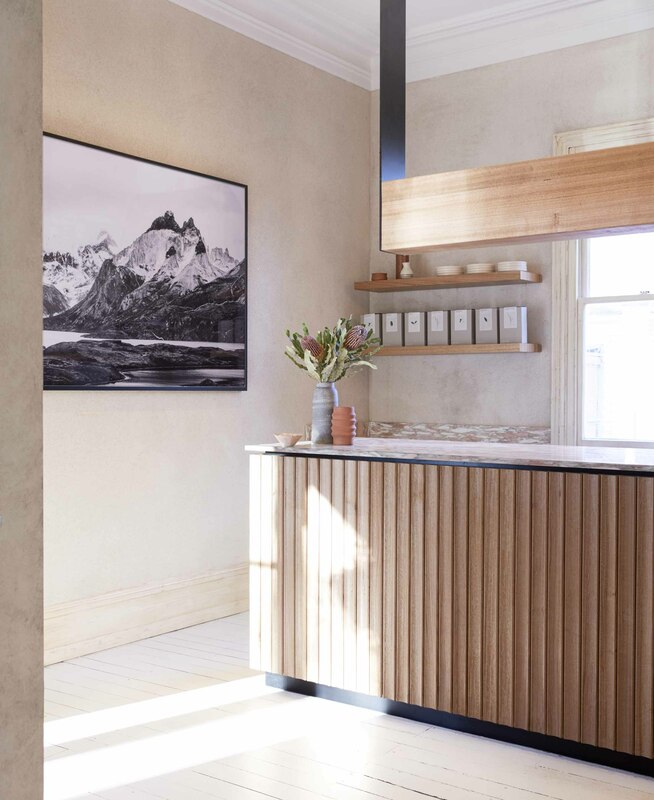 To the front a timber clad bar is topped with Norwegian Rose marble that is also used for a slim splashback to create a visual echo. A suspended gantry provides additional storage while clearly defining this area’s role as professional as opposed to a kitchen island. Reinforcing this is a side detail of geometric steel framing obscured glass. It is a nice touch that allows the staff to be both in touch with the room while also held apart. The dining room to the left is similarly a textural exploration. Here, French washed blue walls (Mist, Elysian, Porter’s Paints) are teamed with sheer linen drapes (Mist, Melange, Westbury Textiles). Lighting for this room is centred by a large bare bulb pendant suspended from the ceiling, with Volker Haug’s Anton wall sconce in gun metal. 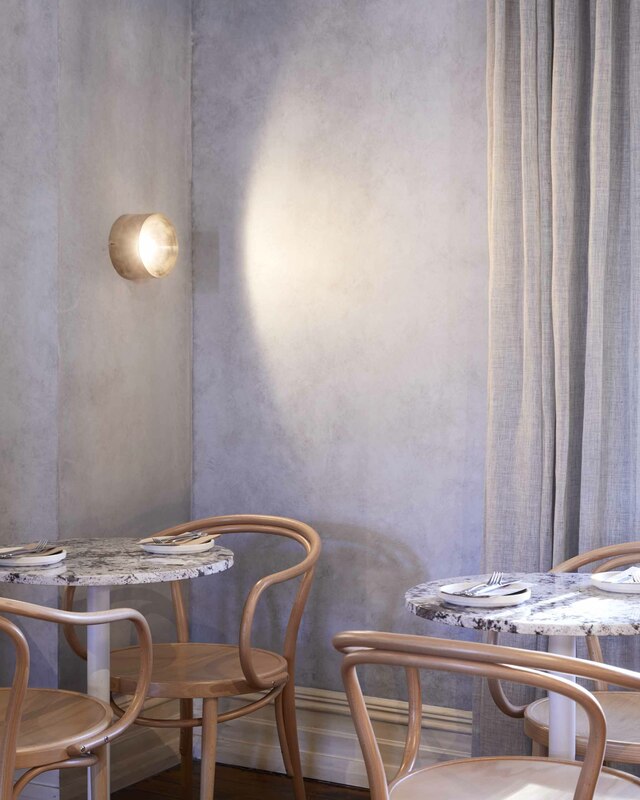 Bentwood chairs (James Richardson) are paired with tables with a strongly striated white and grey marble, which again plays back to the textured walls and marble clad fireplace. Madeline McFarlane’s art and object curation makes good use of the large format photography of Kara Rosenlund. Objects share a muted rose and cream palette, giving their form and silhouette dominance over utility. It is cleverly done and, while speaking of the Heritage era of the home, is certainly not a vintage homage. The private dining room is arguably the most beautiful of the dining options with a bay window, floral cushions and a divine lichen shade of green for the velvet upholstered chairs (Brutus, Catapult). 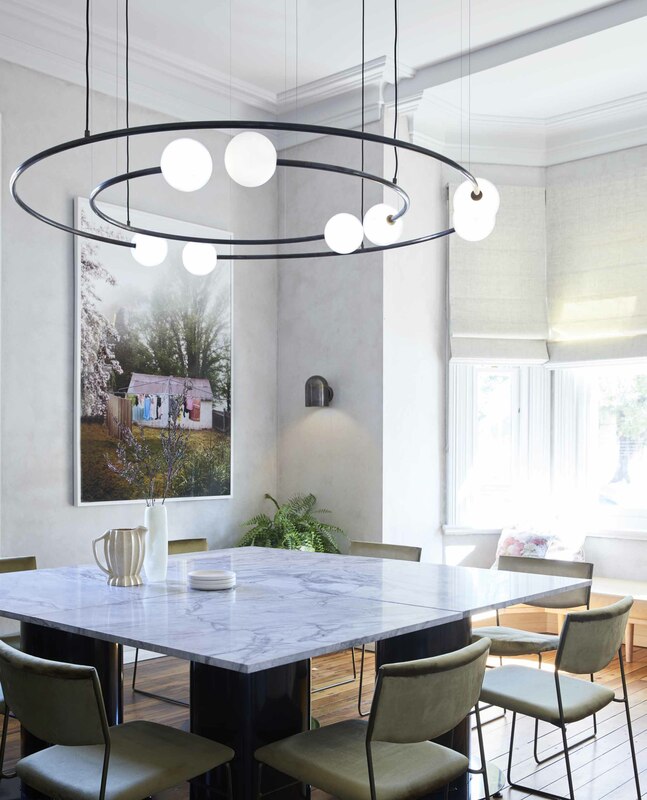 A set of four bespoke tables are joined for a large dining table, while the whole is anchored by the concentric rings of an extremely elegant pendant light (Oddments, Volker Haug). The marble used for the table is softer with washes of pale grey spanning the dominant white. Rosenlund’s Dividing Range brings a slight rose warmth to the whole. 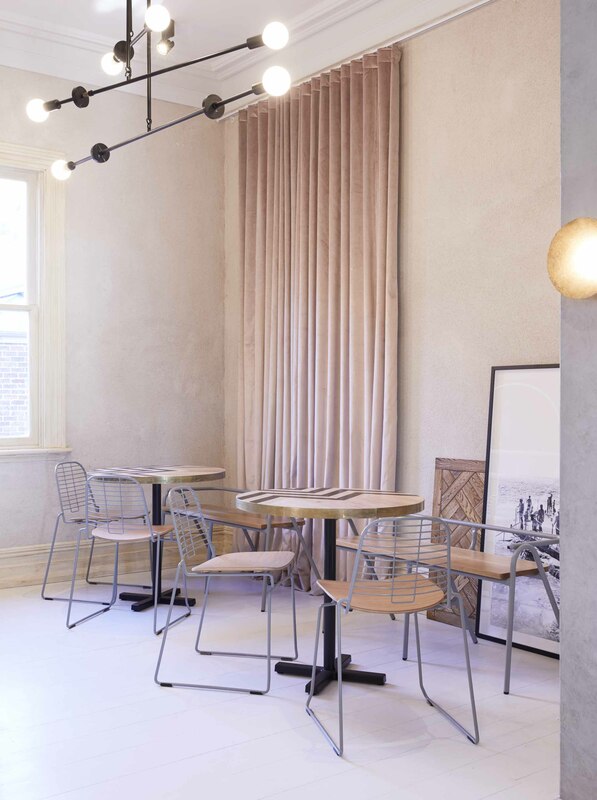 Outdoors, the touch continues to be light with Volley armchairs and Good One stools (both Tait) teamed with Flower folding chairs (Cafe Culture), Adam Cornish’s Strand chairs and Hay’s Don’t Leave Me side tables (both CULT). The elegance of this project resides in Woods’ allowance of the gorgeous elements of the architecture’s generous scale and attention to decorative detail to inform the interior. It also lies in the changing face of Penrith, which has steadily grown as a food and wine cultural precinct. Moreover, it is just plain beautiful, light filled, confident, resolved and a delightful place to dine. This article originally appeared in inside 104 – available online and digitally through Zinio.